What`s Your Point? What’s Your `Why`? Of the business books that I’ve been reading, I’d like to highlight two recent ones. They both talk about how to get your point across in today’s marketplace, but the book being reviewed here Simon Sinek’s “Start with Why” urges you to tell your market your inward motivation for what you do, while another book I recently read (Brian Solis’ “Engage”) takes the outside-in approach. 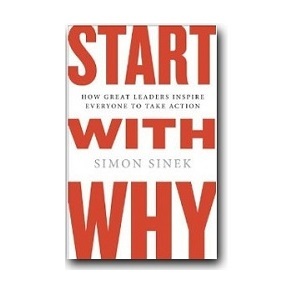 “Start with Why” is a book about leadership, behaviour, culture, messaging and vision. I’ll use the author’s visual metaphor to describe its main theme. Imagine that human interaction starts at the outside ring of three concentric circles. At the outer edge we initially know What someone or some company does. Then we progress to an inner ring, showing How they do it, and lastly at the epicenter, we can see Why they do it, their main motivation, their raison d’etre. Sinek calls this progression the “Golden Circle” and he urges us all to invert it, so that first encounter revolves around Why, not around What. That five minute talk would, in my view, be Dr. Jones’ Why, his central motivation that explains everything he does. This line in the movie also illustrates a problem with Why: it’s so deep-seated in our emotions, we have a hard time sharing it with others. A central part of the book is to be up front with your Why – don’t bury it in paragraphs of verbose mission statements. The reason Why you belong to an organization (or maybe founded it) is self-evident to you; it should be as visible to others. It’s there, though you may need to look inwardly to rediscover it. Sinek hopes that the Why can be as plainly obvious to employees and the marketplace as it is to the owner and other key participants. It takes effort to lead an organization where everyone knows Why they are there. “It requires the discipline to constantly talk about and remind everyone Why the organization exists in the first place. It requires that everyone in the organization be held accountable to HOW you do things – to your values and guiding principles. And it takes time and effort to ensure that everything you say and do is consistent with your Why. But for those willing to put in the effort, there are some great advantages.” At the same time, there’s a big payoff for getting everyone to understand the Why – Sinek says that “Customer and company are now one and the same,” when this point is reached. Sadly, many companies stray from their founder’s vision over time, and lose their Why. As consumers, we’ve all witnessed the importance of Why. We don’t like being marketed to, but we are attracted to buying from companies which plainly say Why they’re in business. He states, “those who are able to inspire give people a sense of purpose or belonging that has little to do with any external incentive or benefit to be gained. Those who truly lead are able to create a following of people who act not because they were swayed, but because they were inspired.” So you as a leader should demonstrate that you believe in your own cause, because then your employees and/or your customers will also come to believe in it and make it their cause. To show how a Why injects energy into corporate messaging, he takes a standard pitch or two and pretends he’s an ad agency, rewriting them from a Why perspective. In TiVo’s example, the pitch would go from “our device records TV shows, enabling playback of any part, anytime” to “Hate TV commercials? We do too; our device lets you watch your shows and skip the rest!” See the difference? I think he could have rewritten a few of these pitches better; it’s hard to convey in book form and would be much easier to illustrate using media like sound and image, to give the full effect. Though Sinek’s message isn’t completely groundbreaking (there’s usually a Why behind anything risky or unconventional that we take on), his book is important in that it reminds us to stay true to that passion long after the initial inspiration wanes. 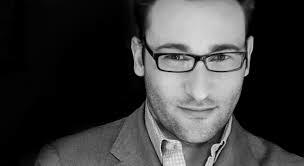 An update if you find yourself agreeing with Sinek, his new book “Leaders Eat Last” probes into why management vision is so crucial to mobilizing others to act. It’s at http://www.amazon.ca/Leaders-Eat-Last-Together-Others-ebook/dp/B00DGZKQM8 and you can expect to take away many lessons internally for organizations, as well externally when marketing and engaging with the buyers following your vision. 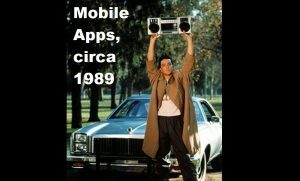 Mobility is here; Now where’s mobile marketing? What do I need to know before I do A/B Testing?